Thank goodness for these challenges to get me back to blogging!! 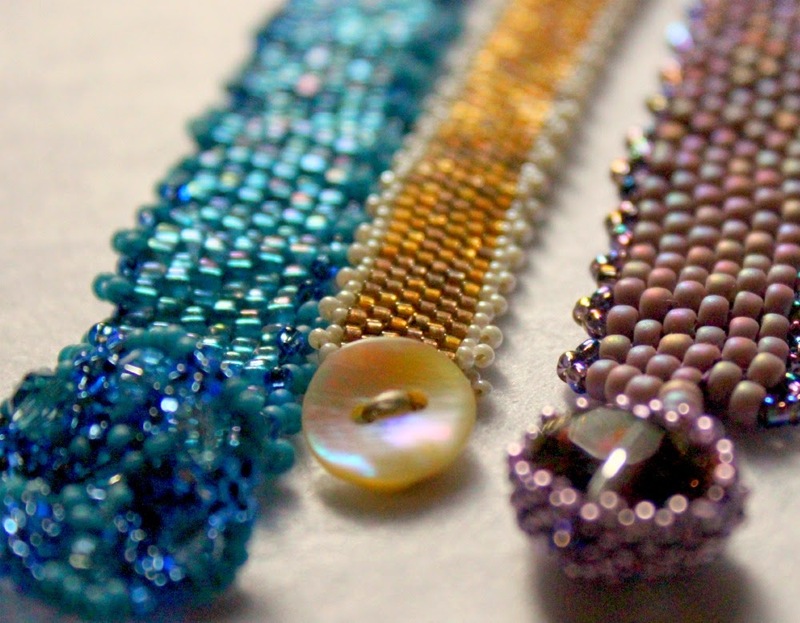 Truth is, I've been beading quite a bit, but every time I think I can get a post written....well, my schedule seems to have other things in mind!! I should add here too, that I've been terrible on my reading blogs as well!! So let's get to the challenge at hand, which is the fifth installment of Therese and Christine's A Time To Stitch challenge! This round was a little different, and the directive was to pick one stitch, and do it three times in a different size, shape and/or color bead. What a wonderful study in design!!! I picked my go-to stitch, peyote. And one of my go-to designs of peyote stitch with picot edging. I tend to always do this design with delicas, since they sit so wonderfully next to each other. But jeesh - when you try other sizes and shapes - all sorts of wonderful things happen!! I have one here with delicas and the picot edging is done with 13/0 size beads. For the purple, I used 8/0 matte purple beads with matte a/b finish, and 11/0 seed beads for the picot edge. And the blue bracelet is done with 10/0 triangle beads. Look at how wavy it is! I had a ton of fun with this challenge and I think it's a wonderful study in the role of size, finish, shape, and color when working a technique! Please visit the other participants in this round of A Time To Stitch! Thanks to Therese and Christine for a fun and useful challenge! With peyote, this challenge purpose is achieved by clearly. So it is good choice to pick peyote Amy. They all are gorgeous. I should really try my hand at flat peyote again. The first few times were epic fails. Ooh, I love the wave from the triangles! What seemed like a simple challenge is really leading to some fun and interesting results, isn't it? They are all lovely! Hi Amy, I love your bracelets. This was a great challenge. 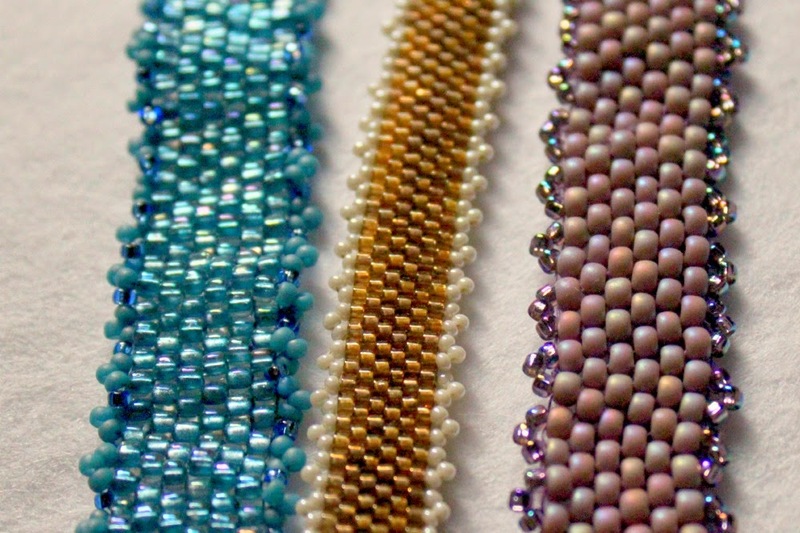 It's always interesting to see what the same stitch with different style beads, looks like. Hope all is going well. Summer has finally arrived in MD! Great pieces Amy. I love the aqua one! Still amazing how one pattern can make so many different pieces. I know exactly what you mean about the lack of blogging and reading...sigh. I love all three of these babies! I think I would be wearing the wavy blue all the time, looks like a dream! You and I definitely have the same color love in our stashes! Peyote is a favorite of mine too....love seeing the designs that have come about by changing the beads....have fun wearing them!! I love that you've treated us to three monochromatic designs. Really illustrates the challenge! My favorite would be the coppery colored bracelet - reminds me of happy, sunwashed summer afternoons. It would be fabulous to wear now, and equally great come winter when we're longing for these days of summer! Oh how I know what you mean about having time to post and to even read just a few of the blogs. If it were not for challenges to get me to blog, I would have left blogging behind. Maybe that is why I asked Christine to help me out with ATTS. I love your bracelets and it is amazing how a change in a color or a bead size or shape can change the whole look of the piece. I am going to say the blue one is my favorite of your three, my eye just keeps going back to that one. Thank you so much for participating in this round of ATTS it is always a pleasure to see what you have created. I hope that you will be back for ATTS 6, besides Christine and I you already have a sneak peak it what it will be about, SHH don't tell ;-). Me too - Peyote is my go-to stitch! and these are really great color choices, along with the picot on the edges. I've never added that before; going to have to try that! I really love the rich color of the center bracelet - I'd wear that one pretty much every day! I love peyote, the result is so smooth and fluide and the stitching it so relaxing, I love the blue triangle variation, it is indeed wavy and makes me think of a river flowing. Great work. I just want to run my finger up and down the matte purple bracelet. Great choice of colors and edging. Use of triangle beads is very enticing, it adds such an amazing depth of sparkle. Amy! You did what I was going to do before I went with the earrings! I was going to do straight on peyote with picot! LOL I am so glad you did this. There is nothing more comfortable than a peyote bracelet wrapped around your wrist. And you showed so well how your color choices, size, and shapes take the same stitch but make it look different. Love your bracelets and the colors. Bead on, my friend! 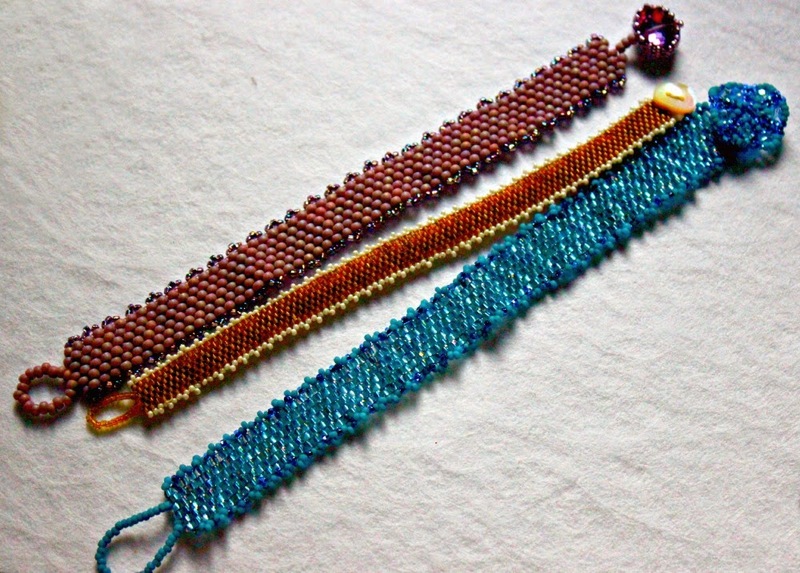 Great peyote stitch bracelets. My favorite stitch!! I especially love the one you did with the delicas. So dainty and such great colors!! Yes, definitely a design study using different beads and Colors and see what happens! I'm in love with your bracelets, especially the blue one.